Get an inside look at science as it happens in the Caribbean. This week we explore some freshwater mysteries on St. Kitts and Nevis. Filming river life in a mountain stream. Diving into the vibrant ecosystems of mountain streams on St. Kitts and Nevis, one has to wonder—how did everything get here? Imagine starting at the coast and heading up a ghaut—the local term for the steep ravines found all over these islands. You’re bound to hit a long stretch of dry riverbed before reaching water at higher elevations. Where there is water—at places like Wingfield River, Cayon River and New River Spring—it can be full of freshwater shrimp, crayfish and goby fish. It is amazing to think that these animals can survive in these remote streams. It’s even more amazing to realize that all of these animals traveled here from the sea. Many Caribbean freshwater species need to live in the sea for part of their life cycle. It’s not rare to catch a river shrimp or crayfish with a mass of tiny eggs under its tail. But their tiny newborn babies will die if they don’t reach the sea within a few days. They depend on a good rain to wash them down the ghaut into the sea. 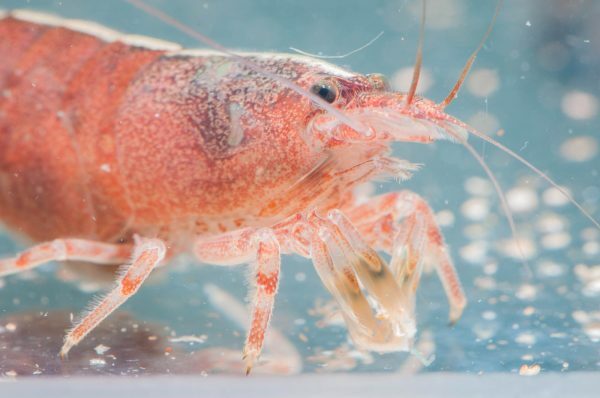 After they have grown some, young shrimp and crayfish will return to fresh water, again depending on the temporary flow of rivers and streams reaching the sea. They travel upstream to mature and complete their life cycle. One of the most amazing abilities these creatures share is a talent for climbing. River shrimp, crayfish and the Sirajo Goby fish are all able to scale rocks and climb up waterfalls to reach their mountain homes. The Sirajo Goby uses specialized fins that form a suction cup. River critters can be expert climbers. This all seems pretty complicated, but if these animals didn’t spend part of their life in the sea they wouldn’t have reached these islands. They also use their climbing skills to escape from predators. Some larger fish—like Mountain Mullet—are predators that eat young shrimp and crayfish. By climbing above obstacles like waterfalls they can reach areas that can’t be reached by predatory fish. Walking up to a mountain stream can be a challenge for us. It is almost unbelievable that a crayfish or fish could travel from mountain to sea and back again. The unstoppable spirit of nature is a wonder to behold.